I love it when I actually feel as though I have accomplished what I set out to do or in this case a bit more then I had planned. Let me back up a bit. I tend to purchase a lot of my beading supplies on impulse. Which is all well and good except for the fact that I end up repurchasing a lot because I had ran out of storage so everything was crammed together. So I decided that I need to start picking up some storage units especially for my brass as I have found a new supplier with killer deals that I can't resist. 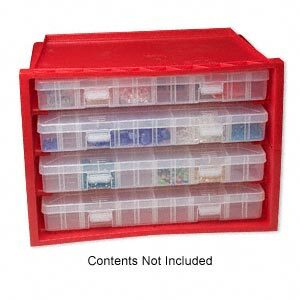 It has little dividers that I can set up as I need with up to 96 compartments! Just what the doctor ordered. So yesterday I put on one of my audio books and organized my copper. I even went on and organized some of my crystal into an old spice rack I had. I think that I need to start hitting GoodWill and find some more of those. Oh and as a side benefit, I had a necklace hanging around that I had ran out of bead caps for. And I couldn't remember where I had ordered them from so that I could replace them. Well in my organizing spree, I managed to find another package of them so I finished that necklace and started another. How is that for a productive Sunday?